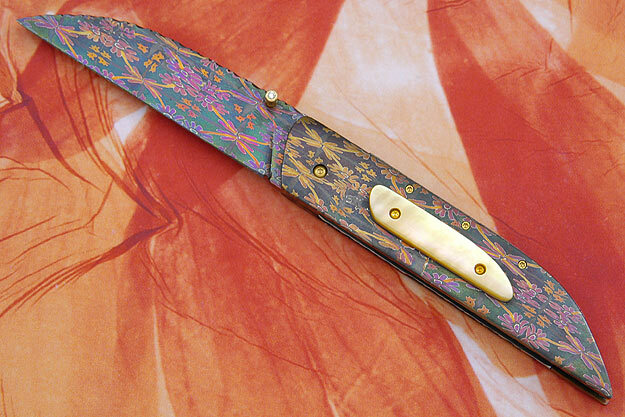 This post was suggested by Kirk Lee Spencer speaking about the color of pattern-welding in the "Your last sword" thread, but I preferred to open a new thread because the subject seemed off-topic. Here are some knife blades made of mosaïc damascus (patter-welding) by the swedish bladesmith and knifemaker Mattias Styrefors. He told me that the colors are obtained by using different kinds of steel and nickel and only by heating. As can be seen colors are mainly in the blue, violin, purple or brownish tunes. Wow....I am indeed amazed! I was just re-reading The Lord of the Rings and was reminded of the "red" patterned-welded sword that one of the hobbits gets from the Barrow mounds. I remember thinking...."oooh....that's neat that Tolkien thought of having a pattern-welded sword come in red!" Now I'm thinking..."oooh, they come in multi-colors too?!"